It can be a daunting task when you look into purchasing your first road bike. It is very easy to take a quick look at the bikes modeled by Sir Bradley Wiggins and immediately recoil at the price tags reaching into thousands of pounds. Of course, bikes are fantastic for many other reasons, not least of all regular exercise. Bikes are a much more environmentally friendly way of travelling to and from work. They have the added bonus of being considerably less stressful than travelling by car. A bike gives you the chance to take in the world around you whilst you’re on the move. It is also considerably cheaper to maintain a household bike than a family car. Whatever the reason for choosing a new bike, there is a great range of cheap road bikes and viable new options out there for someone looking to invest. What am I looking for in a road bike? Are you on a strict budget? As we will be looking at the best cheap road bikes, we will look at models with price tags no higher than £200. You may be looking to spend less than this. You may find your options limited by your budget. If this is the case, you will need to ensure your bike reaches the basic levels of safety. Whilst it is important to save money on your purchase, you do not want to be left with a bike unfit for safe use. Many bikes feature a level of self-assembly which usually detract slightly from the price. However, these bikes do require you to have the ability to safely put the bike together. If this is the case, remember to follow the instructions carefully to avoid injury. What sort of size bike are you looking at? This is very important as it will affect how comfortable you are on your bike. It will also determine how freely you are able to move. This is important as riding a bike is essentially an exercise session. You do not want to be constricted by a small bike nor do you want to be overstretching your muscles to ride a bike that is too big. If your bike is too big or too small, it can cause problems when you stretch and in extreme cases, lead to injury. Different people suit bikes that are better designed to fit to their individual needs. For this reason you will need to do a little guesswork based on your bike and your leg and arm measurements. If you have problems after purchasing your bike, it is important that you rectify this by having it adjusted or replacing it. If you are not comfortable riding your bike, it is not the bike for you. What size wheels would be best suited for your bike? There are dozens of different wheels for experienced cyclists all designed to get the maximum momentum. However, for a good cheap reliable bike, there are perfectly good wheels that are safe and well-designed to your more basic needs. 26mm are around the standard for an average bike. Some bike wheels can be anything up to 29mm for a smoother ride but this will take more effort to pedal. You must also consider your usual route as thicker tyres will be necessary if your route is bumpy or gravelly. The wheels that come with your bike should be designed with the frame of your bike in mind. Whilst speed is important to consider when deciding the height of the wheels, these bikes are specifically built for the casual rider. This means that they are unlikely to have been designed to reach maximum cycling speeds. Your bike will include the essentials when you purchase it. Of course, bikes do become damaged over time and it will be likely you have to repair your bike at least once. For this reason, you must look at the quality of your bikes components when you first buy it. Replacing damaged gears, handlebars or pedals can be expensive. The important components to focus on your new bike will be the chain ring and the disc-breaks. If you are assembling these yourself, ensure you follow all instructions and check tightness to avoid injury. What type of frame are you looking at? The frame makes up the majority of the bike and has a large effect upon the size, weight and overall stability of your bike. Bikes can be made from aluminium, steel, titanium or carbon fibre. Aluminium is inexpensive and tends to be the most common frame-type for day to day road bikes. Aluminium can be a little heavy, however it holds together really well and can withstand a lot of stress on the joints. Steel frames are slightly more expensive but can be made into strong frames with further strength of the joints. Steel is more durable than aluminium and take a lot more weight. Titanium is more commonly found on bikes at the higher end of the market. This is because is it strong and light but also corrosion-resistant giving it a longer life. The weight and size of your frame are the most important things to consider. This jet black road bike has a light aluminium frame that is specifically designed for the casual biker. The bike comes easy to assemble with the frame already together in the box. The bike features a slightly larger frame that is deceptively light. This would therefore be an ideal bike for a larger person with longer legs. The gears can take a little wearing in when the bike arrives but this should soon sort itself out after a while. All in all, this is a great bike for somebody who is looking at taking up cycling or beginning commuting to work. At around £180, this bike provides great value for money and features breaks and gears that are unlikely to need repairing in the near future. This steel bike comes in a fluorescent shade of yellow that will certainly make you stand out on your daily commute. The bikes frame is quite small at 22″, this means it would be better suited to a shorter individual. The bike is made of steel which adds significantly to its weight putting it at around 14kgs. This means it despite its small size, it might be more difficult to use for a daily commute. The bike also requires frequent cleaning and lubrication in order to keep it functioning. All in all, this bike has been criticised for being too small and heavy to be practical for a daily commute. The bike retails at around £130 but comes with its share of problems. This smart sturdy bike comes in blue and is comprised of a steel frame. The heavy steel however has led to it being slightly heavy for everyday use. The bike also requires a degree of assembly when it arrives so it is important that all attachments to the frame are firmly together. When assembled, the bike is a good sturdy size and the frame is welded together extremely well. The gears feature 6 different speeds and a comfort saddle with grips. 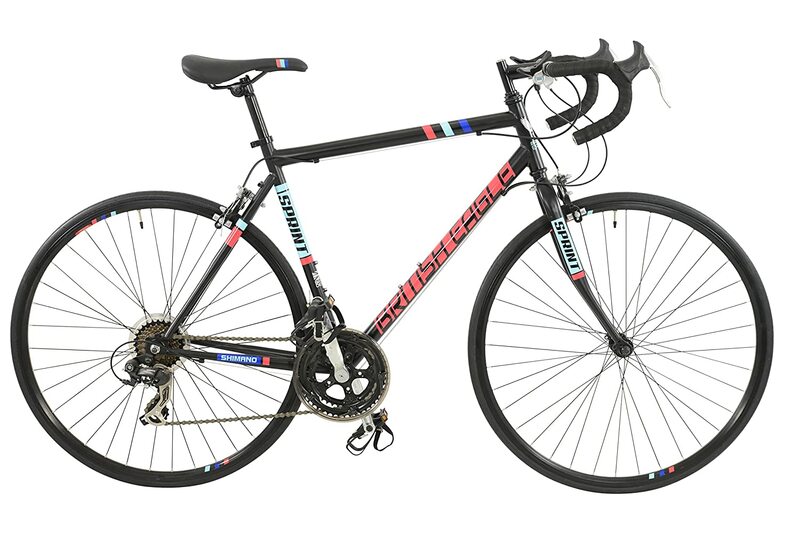 This bike retails at around £150 which is a reasonable amount for a cheap road bike. Its main drawbacks are its weight and its difficulty to assemble. This sleek grey and blue bike is made up of a 19″ frame, mudguards and a rear-mounted luggage rack. The bike is steel and is designed with the day-to-day commuter in mind. The mudguards are a good size and handy addition for travelling on rougher terrain. However, the steel frame does make this bike quite bulky and heavy particularly with the addition of the mudguards and the luggage rack. If you are able to store your bike outside this bike is great value for money at around £150. This tidy black frame bike features a luggage rack at the back and 18-speed gears. The bike benefits from its slim frame and is deceptively large for its 22″ frame. To accommodate its size, the wheels are slightly larger than most at 28″ leaving this bike better suited for somebody around 6′. On the plus side, this bike is very quick to assemble from the box. It can be roadworthy in an hour from the time you take it out of the box and the gears are impressively easily to attach. The mudguards at the front and back are an added bonus and despite the steel frame, its surprisingly lighter than other models and the welding is well done. This bike retails roughly at around £150 which is a great price for its easy assembly. This is a great professional looking steel framed bike with stylish curved handles. Although it has a steel frame, it is well designed and advertised as ‘lightweight-steel’. This makes the bike not as heavy as similar sized steel models. British Eagle have paid particular attention to the frame which is incredibly supple and well-welded. The bike features 14 speed gears and the wheels are 28″ putting the bike at slightly larger than other similarly priced bikes. One small problem is that the gears do struggle to change quickly. This can be a problem if you are travelling uphill. This bike is also at the pricier end of the market retailing at around £200. This tidy road bike features a slick black and yellow finish with a lightweight steel frame. Once again, this particular road bike has been fitted with light-weight steel which does make up for it bulky frame if only slightly. The bike features 14 gear speeds and features drop style handlebars that are ideal for travelling at high speeds. The bike weighs in at around 14kg which is impressive as a result of the chunky size of its frame. This bike is priced at around £200 which would be a reasonable price if the bike wasn’t so bulky. This well-designed white bike is very well built and requires minimum construction. In fact, you’ll more than likely find yourself on the road within an hour. All you need is a spanner and a set of Allen keys. This bike features a high quality racing saddle. It weighs in at around 11kg making it extremely light for its size. This bike retails at around £200 but the quality is definitely that of a more expensive bike. One minor flaw in this bike is that the bright white colour is difficult to maintain. For this reason you might consider giving it a paint job of your own. Despite this, a great purchase and great value for money. This stylish aluminium red bike is let down slightly by its heavy aluminium frame. Despite this, the bike takes minimal time to assemble and handles well from the offset. The brakes are professional and the bike handles are designed for the experiences rider. The gears features 14 speeds and the seat offers a comfortable ride. The bike isn’t suitable for an experiences cyclist but is ideal for commuting and for periods of exercise. This bike is sold for around £200 but with the addition of accessories the price can increase. For this reason, any specific modification you need to do will result in a much higher price tag. Despite that, a great buy and ideal for the casual cyclist. This trendy bike comes in a variety of colours and features a choice of different sized frames to specifically suit the rider. The bike begins at about £170 but certain sizes can push the price of this bike up considerably. This will be a factor to consider if you’re designing your bike for a specific size. The bike features some great pattern options and features a handy micro-adjust seat post to ensure comfort. The bike is ideal for commuting and perhaps not suited for the experienced cyclist. The brakes and gears hold up well and are very simple to assemble. All in all, a great bike for a cyclist on a budget looking for a comfortable ride. When looking for a bike for everyday use, it’s important to understand that a lower price tag means you are unlikely to find a bike to go long distances on. For this reason, its best to see which bike is the easiest to assemble and is likely to last you for the longest period of time. Many of the road users who prefer the above bikes are usually professionals looking to commute or casual cyclists looking for a bit of exercise. This limits what you can expect for the bike with such a low price tag. If you are more concerned with a bike for long distances or serious cycling, it would definitely be worth investing in a pricier model from a well-known and established brand. 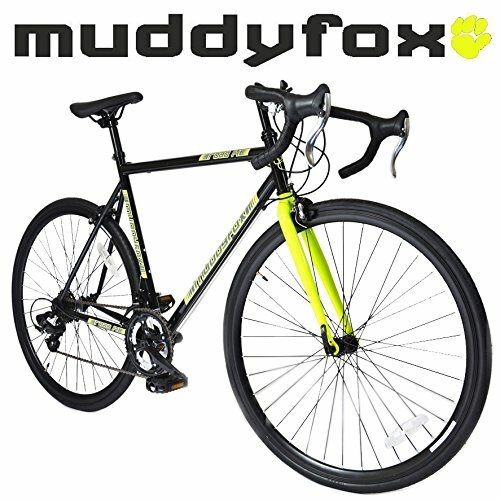 If, like many road users, you are looking for a bike to commute through London or travel short distances, the Muddy fox brand specialise in cheap affordable bikes and equipment. They also offer great customer service to assist you should you struggle during assembly. They also offer a distinct range of different size frames and accessories if you come into problems in the future. This entry was posted in Bikes.